Billed as The 4th Film From Quentin Tarantino, Kill Bill is a stylish, colorful, gleefully over-the-top, and energetic hodgepodge that doesn’t quite keep up momentum for its entire runtime and engages in a few too many occasions of self-indulgence but should still provide plenty of entertaining scenes for fans of Desperado or Once Upon A Time In Mexico. The story is certainly simple enough, although we play around with the chronology. The nameless Bride (Uma Thurman) shows up on Vernita Green’s (Vivica A. Fox) happy homemaker doorstep in Pasadena, California to settle a score. The rest of the movie takes place before the opening scene, sketching out the massacre of the Bride’s entire wedding party by an enigmatic man named Bill (David Carradine, never clearly shown) and his Deadly Viper Assassination Squad (Fox, Lucy Liu, Daryl Hannah, and Michael Madsen), who put her in a coma and leave her for dead. After four years, the Bride awakes, escapes the hospital, and sets out to work her way down her Death List, until she can finally Kill Bill. But first, she sets her sights on O-Ren Ishii (Lucy Liu), once a henchwoman of Bill’s, now the head of Tokyo’s criminal underworld. As should be expected from a product of the twisted and quirky mind of Quentin Tarantino, Kill Bill is off the beaten track, albeit not quite as bizarre as some of his other works, including Pulp Fiction. For those familiar with Tarantino, there are plenty of his usual calling cards: the eclectic soundtrack, including lots of 70s music and nods to spaghetti westerns, the titled chapters dividing the film, and the intentionally retro opening credits that look like we’re about to see a movie made around 1970. Tarantino pulls out the visual stops, doing lots of zoom-ins on feet and faces and eyes, freeze-frames when Bride recognizes one of her enemies, an entire lengthy backstory sequence shown in anime, and random switches to black-and-white and silhouette during the seemingly neverending climactic fight. Like Desperado (albeit with an extra dash of quirkiness), Kill Bill isn’t quite an outright comedy, but it’s not taking things very seriously either, as evidenced by the way blood shoots from wounds like a geyser. Many of the funniest bits are little throwaway touches: the sunglasses-wearing sheriff’s (Michael Parks in a cameo) dashboard lined with a row of more sunglasses, the way the Bride’s name is bleeped out whenever a character threatens to reveal it, and in a detail I found particularly amusing, the Bride carrying around a notebook with a page marked Death List, with the names written bigger the further down they go. Tarantino is telling a simple revenge story, but also makes it a parody of kung-fu movies and fills it with his usual wildly diverse and often deliberately ill-fitting soundtrack selections, and all kinds of either homages or jabs, depending on how you look at it, at pop culture and film cliches, like the climactic one-on-one fight between Bride and O-Ren just having to take place, of course, in an idyllic, snow-covered Japanese tea garden that looks straight out of a postcard. Looking for logic here is a fool’s game. How can the Bride carry her samurai sword onto the plane with her? Because she can. 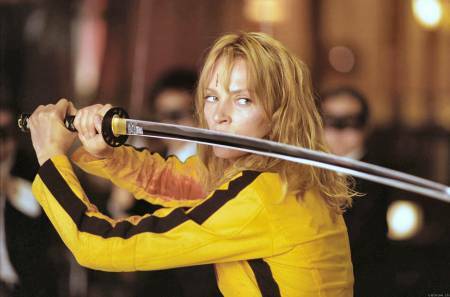 Uma Thurman, who I usually find rather bland as an actress, is a firecracker here, perfectly credible as an unstoppable killing machine/action heroine, as well as in her few more serious moments. No one else has too much to do; Lucy Liu and Vivica A. Fox don’t have much required of them besides looking dangerous and performing one fight scene each (although the scene of Liu screaming at her underlings while holding a severed head is one of those things that lingers in the memory), while David Carradine, Michael Madsen, and Daryl Hannah are kept in the background to take their turns in Vol. 2. Kill Bill has uneven issues. It starts off knocking one out of the park with a high-energy and wildly entertaining fight between Uma Thurman and Vivica A. Fox that would look right at home in one of the Jason Bourne films, and keeps up its momentum through the Bride’s escape from the hospital, but then Tarantino’s self-indulgences start to creep in. One entire chapter is devoted to a lengthy anime sequence detailing the origins of O-Ren Ishii that brings the pace firmly to a halt, particularly as none of the information relayed to us has any particular relevance at any other point in the movie (also, none of the other members of the wordily named Deadly Viper Assassination Squad is given anywhere near this level of backstory). As high-energy and gleefully over-the-top as the climactic fight scene is, with the Bride taking on what seems like hundreds of O-Ren’s bodyguards before the final one-on-one swordfight, it goes on for about half an hour and after a certain point it starts to feel redundant. There’s only so many times Tarantino can show blood shooting like a geyser, or switch to black-and-white, or show the figures fighting in silhouettes, to keep things original. But despite its flaws, Kill Bill Vol. 1 still provides plenty of over-the-top gory action, and the kind of offbeat humor Tarantino’s fans expect. Don’t look for logic or realism, just strap yourself in and enjoy the wild ride.